The Boyf and I find ourselves, on a regular basis, fantasising about the day we might have the space (and deem ourselves responsible enough) to have a little puppy dog all of our ownsome. Our current abode overlooks a green which is often teeming with dog walkers, and many's the time we wistfully call each other to the window to point out which hound is our all-time favourite. But then on the flip side, there are the days we look outside into howling winds and torrential rain and witness said dog walkers shuffling begrudgingly down the green's ever-muddying path, fervently picking out poo bags from their pockets with their shivering bare fingers, and we start to wonder if maybe it's quite all it's cracked up to be. Perhaps a pet cushion might be a better option instead - you can snuggle up to them on the sofa, safe in the knowledge that they will never demand walkies in unseasonal weather, and they certainly won't foul on your floor or use your ballet pumps as a chew toy. 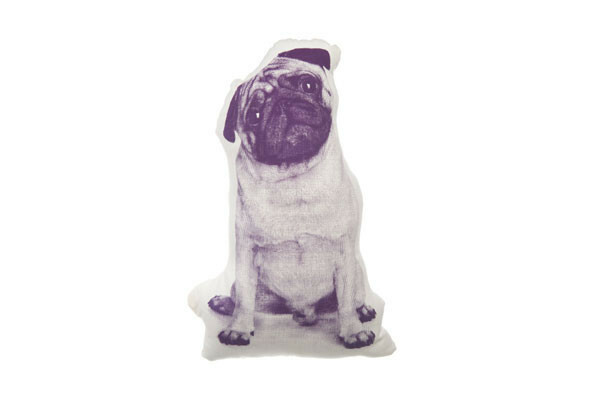 Available in an array of designs (or "breeds", if you will), each dog has been lovingly crafted into a 2D interpretation of its real-life alter ego, and the colour options will allow you to colour-match your pooch to your interior, without involving fur dye and a visit from the RSPCA.